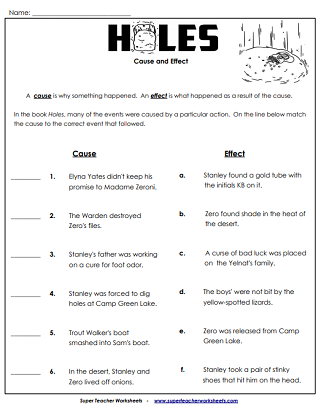 This page contains printables that can be used for a literature study unit on the book Holes, by Louis Sachar. Download and print reading comprehension questions, vocabulary activities, bookmarks, and puzzles to use with the book. This worksheet has questions about Stanley's first experiences at Camp Green Lake. For this multiple choice vocabulary activity, students will choose the correct definitions for the words convicted, barren, desolate, and hastily. For the first six chapters of this book there are 5 vocabulary word cards and 5 matching definition cards to print and practice with. For these chapters students will answer questions about what Stanley discovers while he is digging his hole. In this vocabulary matching activity students will find the correct definitions for words such as excavated, enviously, preposterous, and aimlessly. Chapters 7-13 have 10 vocabulary words to review, including: preposterous, excavated, compacted, accomplish, scowled, and more. After reading Chapters 14-20 students will respond by answering comprehension questions about the Warden and her true motives behind the holes. In this vocabulary worksheet students will use words from Chapters 14-20 to fill the missing letters. This printable card set has 10 cards to be used for vocabulary practice with 5 word cards and 5 definition cards. This picture shows Mr. Sir's sunflower seeds in the bottom of Stanley's hole. Students will write a few sentences to explain what happened in that scene. This worksheet has both short answer and multiple choice questions for chapters 21-28. In this vocabulary worksheet students will look up the definition for the selected words. Words include astonishment, spewed, quivering, drawl, and deposited. The vocabulary words for chapters 21-28 are: spewed, astonishment, deposited, quivering, and drawl. Print and cut out the vocabulary cards to practice. Questions from these chapters address Zero running away from camp and Stanley's attempt to save him. Students will choose the best answer for the underlined vocabulary word. Words include refuge, delirious, feeble, and horizon. Your students will read and review the vocabulary words from chapters 29-35 with these printable cards. In this worksheet students are asked a series of comprehension questions about Stanley and Zero's journey in the desert. The truth about Stanley's incarceration is also revealed. Use the clues and fill in the missing letters to complete each vocabulary word from the story. Words include increments, contritely, precipice, and indentation. The vocabulary words for chapters 36-42 include: contritely, increments, altitude, perhaps, and indentation. These cards can be reused again if you laminate them. This worksheet has both short answer and multiple choice questions that require students to think about the final chapters of the book. Students will match each vocabulary word from the story to the correct definition. Words include summoned, precarious, strenuous, and legitimate. 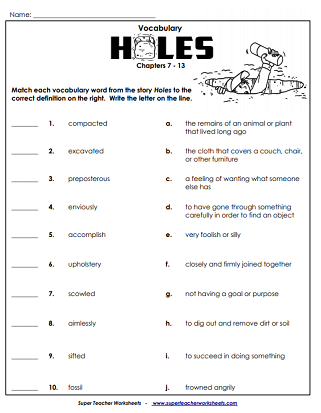 This printable file has 20 cards to use for vocabulary practice for chapters 43-50 of the book, Holes. Students will recall events from the story to answer a series of multiple choice, short answer, and matching questions. Can you find the words from the story hidden in the puzzle? Words include Stanley, treasure, desert, lizard, and sneakers. In this activity students will identify cause and effect by matching the cause to the correct effect. This sheet contains four bookmarks illustrated with a character from the story. This printable can be used as a cover page for your students' literature circle packets. The illustrator is in charge of drawing a scene from the designated chapters. The other members of the reading group will look at the picture and describe what is happening. The real life connector tells how certain parts of the story are similar to events that have happened in their life. The summarizer writes a short summary of their assigned chapters. We have worksheets to go along with dozens of different chapter book titles, including The Giver, Phantom Tollbooth, Mr. Popper's Penguins, Charlotte's Web and many, many more. Use this Because of Winn-Dixie unit with your class. This page has reading comprehension questions, reading activities, vocabulary worksheets, and a whole book test.